Notes on this edition: Paeans for Porter: A Celebration for Peter Porter on His Seventieth Birthday by Twenty of His Friends. Edited by Anthony Thwaite. London: Bridgewater Press, 1999. Pp. 77 + . 22.2 x 14.3 cm. 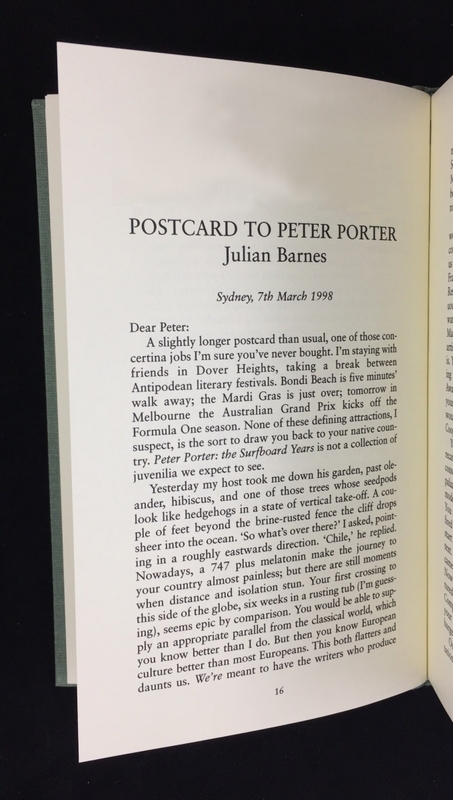 Julian Barnes contributes a piece titled “Postcard to Peter Porter” (Pp. 16-19) for this collection in honor of the poet Peter Porter. Other contributors include: Martin Amis, Alan Brownjohn, Geoffrey Burgon, Wendy Cope, Allen Curnow, Ian Duhig, D. J. Enright, U. A. Fanthorpe, Barry Humphries, Clive James, David Malouf, Les Murray, Sean O’Brien, C K. Stead, George Szirtes, Ann Thwaite, Anthony Thwaite, William Trevor, and Kit Wright. 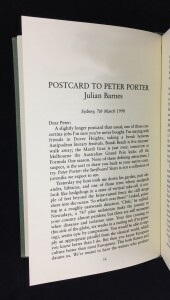 Note: The title page and the top of Julian Barnes’s entry, as pictured, have been altered to remove personal inscriptions from the publisher and Barnes to the book’s owner.